Our “Primary Highways” series continues apace with the state of Wisconsin. We begin with the state capital, Madison, which I wrote about during last year’s protests. We begin with a image of those protests. It looks very cold there, but also quite exciting. Some of us watched these protests in the hope that it would be the start of a resurgent progressive movement. In the eastern section of the capital, we encounter aptly named “Badger Interchange”, in which no fewer than three major interstates converge, I-90, I-94 and I-39. The interchange also includes state highway 30, a short freeway that connects to downtown Madison. Highway 30 ends at US 151, which traverses the isthmus that holds downtown Madison and separates lakes Mendota and Monona. I don’t know of too many other cities concentrated on an isthmus like that. Certainly, the location between the two lakes makes for interesting views and architectural opportunities. Consider this view from Lake Monona featuring the State Capitol building book-ended symmetrically by large buildings and standing behind Frank Lloyd Wright’s Monona Terrace. The city is also hope to the University of Wisconsin, and an arts and music scene. It might be a good place to play as part of that mythical “upper Midwest tour” that I keep saying that I want to do. It of course did not take long for us to encounter a building by Frank Lloyd Wright, a native of Wisconsin. His summer home and studio, Taliesin, is in Spring Green, west of Madison. We take US 14 west from the capital through a green hilly landscape – it’s not hard to see why this might been inspiring for Wright’s prairie style architecture, with its use of horizontal lines and low angles that reflect the expanse of the landscape. Taliesin Preservation, Inc. now occupies the estate and is dedicated to the architect’s legacy. If we head north from Madison along I-39 to its end near the city of Wausau, we can see several examples of Prairie School architecture, including additional Wright houses. This one has a more distinctly modern feel than Taliesin, with more emphasis on straight lines. We return to Madison again, and this time stay with I-90/I-94 westward after they split from I-39. The highway goes by Wisconsin Dells, which looks like a major tourist trap. But the name actually comes from the interesting sandstone rock formations along the Wisconsin River. Skip the amusement parks and head to the river. These formations which are vaguely reminiscent of the higher-elevation features in the southwest, were supposedly cut during catastrophic flooding as an ancient lake drained. The wide river and lush green vegetation, however, make it quite a different environment. It was along I-90/I-94 that I also had a chance to sample Wisconsin’s famous dairy products in its basic form: milk out of a carton at a truck stop. I was skeptical that it would really be that much different, but I have to admit that the chocolate milk was better than anything I had in college (or public school before that). My time on that trip was limited, so I didn’t have a chance to explore the real product I was interested in: cheese. Of course, one can get Wisconsin cheese here in California, and I can live vicariously through blogs like Cheese Underground until I get a chance to go back. Next, we head east from Madison on I-94 towards the state’s largest city, Milwaukee. As we approach the city, we pass through the Zoo Interchange, one of the states oldest and busiest. It currently serves as the junction of I-94 with I-894, the “Zoo Freeway” and US 45. I like the name “Zoo Freeway”. Of course, the name of both the freeway and interchange derives from proximity to the Milwaukee County Zoological Gardens. I-94 continues towards downtown, passing through another large interchange, the Marquette Interchange with I-794, I-43, and US 41. It does look like a complicated tangle. Heading north on I-43 from the interchange, we exit at WI 145 to see the former Pabst Brewery Complex, a shrine to contemporary hipsterdom. The complex closed in 1997. I have to admit, the derelict buildings of the brewery appeal to me at least as much the beer would have. Another great place to photograph, and this one is the National Register of Historic Places so it can’t be torn down (at least, I don’t think it can). Sections have in fact been reopened recently as a “Best Place” and there is a major redevelopment project planned for the entire complex. It is certainly possible to have modern, functioning business inside of a post-industrial shell, so I hope this place does not lose its charm in the development process. I would love to hear from people in Milwaukee about what is happening here. Just to the east, we approach the downtown area and the Milwaukee River. The urban riverfront has pedestrian access via the Riverwalk. This looks like a great way to see the city and its connection to the river, with buildings coming right up to its edge. The walk continues is segments north and south, including into the historic Third Ward with its older buildings, wedged between the river and I-794 (the Lake Freeway). We can travel along the lake on I-794, and then continue north on city streets back into the downtown. Here we can see the spectacular modernist wing of the Milwaukee Art Museum (designed by Spanish architect Santiago Calatrava) jutting out onto Lake Michigan. Milwaukee’s traditional architecture is more of the decorative style we see from American cities that grew in the early 20th Century, but also reflects the city’s German heritage (along with the beer). From Milwaukee, we head north back into the state on US 41 towards Lake Winnebago, the state’s largest inland lake and the only lake in the U.S. named after a recreational vehicle. Along the lake, we pass the well-known towns of Fond du Lac and Oshkosh. This sunset view is looking from the east side of the lake towards Oshkosh, which is hidden below the setting sun. US 41 passes the town crossing over Lake Butte des Morts (named for a nearby Native American burial ground) and the Fox River, continuing around Lake Winnebago and heading northward towards Green Bay. We turn south onto I-43 (which ends in Green Bay) over the mouth of the Fox River and come to the Bay Beach Wildlife Sanctuary, a large urban nature preserve. It is an opportunity for people in the city and beyond to see wildlife up close, in addition to being a center for the rehabilitation of local wildlife. Of course, we must feature one of the wild cats. US 41 continues north along the western side of the Bay of Green Bay (as distinguished from the city of Green Bay), passing by more natural landscape before entering into the Upper Peninsula of Michigan. Wisconsin does not have much shoreline on Lake Superior compared to its neighbors – in particular, Michigan extends quite a bit westward along the south shore of the lake, but it does have the Apostle Islands National Lakeshore. We can get there from Michigan on US 2, passing along the edge of Chequamegon Bay before turning north onto WI 13 along the waters edge to the Apostle Islands. In addition to wildlife and great views of Lake Superior, the islands have unusual “sea caves”, such as these at the edge of Sand Island. In some ways they resemble the Dells that we saw much earlier in this article. We conclude with this lighthouse on the same island, one of several here that guide ships along this edge of the Lake Superior. Our primary highways series continues today with a visit to the state of Illinois. Throughout this series, I have been drawn to many of the large cities of the Midwest and Great Lakes. And none of these looms larger than Chicago. And none is taller. Chicago is home to the tallest building in the United States, the Sears Tower (officially, it is now called the Willis Tower but I doubt too many people call it that). Downtown Chicago is a true vertical city, with not just a few tall buildings, but the densely packed skyscrapers that form deep canyons, much like Manhattan. But the presence of the Chicago River cutting a channel through the middle of downtown is quite unique. The buildings seem to come up to the water’s edge. US 41 / Lake Shore Drive continues north and south of bridge as a scenic expressway with city buildings to one side and beaches along the lake to the other. The south end of the expressway is in the Hyde Park neighborhood, home of a certain Barack Obama. Back in downtown, we find the complicated Circle Interchange, where I-90 and I-94 intersect with I-290 and the Congress Parkway. This interchange, which is often considered one of the worst bottlenecks in the country, connects the downtown to the lakefront and to the suburbs south and west of the city. If we take I-290 west from this geometric oddity of an interchange, we come to the suburb of Oak Park. It was here that Frank Lloyd Wright began his storied architectural career. His home and studio in the town is a landmark, and there are numerous early examples of his prairie-style houses. Looking at his home and studio, one can see the elements that would be later refined in prairie style. There is so much in Chicago I could go on about with regards to art, architecture, music and culture, but space is limited. I do have to give a shout-out to the Art Institute of Chicago, however. It’s collection is large and encyclopedic, but they do have sections that focus on both American and contemporary art. I would particularly like to see the new modern wing, both the building and the art contained within. For music, I invite readers to share the ideas and suggestions of what to explore in the city. Back at the Circle Interchange, we head south on I-90/I-94, the Dan Ryan Expressway., one of the widest and busiest highways in the country. It has wide sections for both local and express lines, and a line of Chicago’s “L” runs down the center. I-90 veers off onto the Chicago Skyway, but I-94 continues south (though designated as “east”) on the Dan Ryan Expressway until the junction with I-57. Continuing south on I-57, we pass by our friend I-80 in the southern suburbs of Chicago and eventually come to Champaign and Urbana after crossing I-74 – it does seem that Illinois has a lot of interstate highways. This cities are home to the University of Illinois at Urbana Champaign, the flagship campus of the University of Illinois. It hosts the NCSA (The National Center for Supercomputing Applications) that created the first graphical web browser Mosaic. It’s hard to imagine life without this technology now, it is ubiquitous and integrated into so much of information, communication and entertainment. Of course, without it you would not reading this article, and I would probably not be writing it. Earlier in its history, the University was home to ILLIAC. At the time it was activated in 1952, it was the largest computer built and owned by an American university. This huge vacuum-tube based machine had 5 kilobytes of main memory and 64k of drum memory. For perspective, consider how much more memory and computation is in an iPhone now. Before we overdose on computer history, we exit Champaign-Urbana on I-72 heading westward. (Did we mention that Illinois has a lot of interstate highways?). This view along the highway suggests just how flat the landscape is in this region, with the road completely straight. Continuing on I-72, we come to Springfield, the state capital. Springfield is steeped in the history and mythology of Lincoln, probably more than any other city in the state. He lived there for 24 years and launched his political career there. And his final resting place, Lincoln’s Tomb is in Springfield. We also find another well-known Frank Lloyd Wright home in Springfield, the Dana-Thomas House. It has rather large and often considered a “prairie mansion”. It does contain the horizontal forms and low angular ceilings characteristic of prairie style, but the most notable features that distinguish are the windows. We head south from Springfield on I-55, on another incredibly straight stretch of highway through very flat landscape. For those who have lived among hills our entire lives, these flat plains are a novel experience. It’s not only the land, but also the sky. There is a significant break in the flat landscape of western Illinois along the Illinois River. Illinois Route 100 runs along the the west bank of the river amidst trees and bluffs. It then crosses a bridge and continues along the east side until the Illinois River meets the Mississippi River. IL-100 continues along the Mississippi as part of the the Great River Road. As one can see, the landscape here is no longer flat. The Great River Road continues past the end of IL-100 and into the greater St. Louis metropolitan area. As the landscape along the river becomes more suburban and then urban in St. Clair county, the road bounces around many other designations, including I-70 in East St. Louis. From here we can continue across the Mississippi to St. Louis itself, or continue southward on the Great River Road as IL-3. We opt for the latter, passing through towns with Egyptian sounding names until we come to Cairo, at the southern tip of the state, where the Ohio and Mississippi rivers meet. We meet I-57 again and then continue into the town itself on US 51. Cairo (pronounced KAY-RO) was once a significant center of trade along the rivers. But it has been in a long decline, and now has a population of about 2,800. Indeed, some views of the town make it look nearly abandoned. The photo almost looks like something from Doug Rickard’s series. It’s sad, but also quite interesting in a way. It’s a long way between Chicago and Cairo, but it would be great to see and photograph both of them in one big trip across the state. We begin our tour on US 1 in Coral Gables, where it is known as the South Dixie Highway. I was actually in a pub along here on Election Night 2004, watching the results with friends and colleagues from the International Computer Music Conference (ICMC). For the most part, the election was quite disappointing – and we didn’t even get to enjoy a controversial Florida result to experience first-hand. So after a night of beers and commiseration, we turned our attention back to the conference itself, and to points north. Heading up US 1 towards Miami, we come to the rather unassuming freeway ramp that marks the start of I-95, the main north-south highway along the east coast. It’s a modest beginning for a such a major road. I-95 is an elevated urban highway through downtown Miami, as is the spur I-395 which took us over the city to the MacArthur Causeway and onto Miami Beach as A1A, one of the more oddly numbered highways in the country. In Miami Beach, A1A continues as Collins Avenue, though the Art Deco district of the South Beach neighborhood. The Art Deco architecture of many of the area’s buildings dates back to the 1920s. One see a certain modernist quality in it, with the details of traditional architectural ornament reduced to simple shapes, but unlike mid-century modernism, such ornament (albeit more abstract) remains. The design of the buildings, the bright colors and the neon lighting are all part of the neighborhood’s character. This was a fun place for food and drink, and to access the beach (it is Miami Beach, after all). The most notable thing about beaches in Florida is that the water is warm, even into the evening. For someone who has lived near beaches in northern California, actually going into the water like this is a bit of a novelty. By the time I had gotten to downtown, where US 41 terminates at US 1., it had begun to rain. I did make it as far as Bayfront Park where I came upon this sculpture. 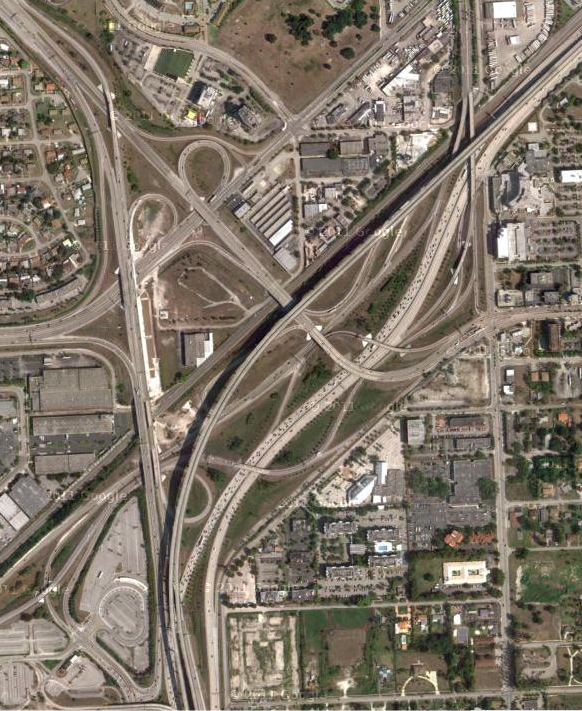 North of Miami, I-95 enters the Golden Glades Interchange along with Florida’s Turnpike, FL 826, US 441, and FL 9. As one can see in this photo, it is quite a tangled mess. From here, one can continue north on I-95 along the coast, or veer inland towards Orlando on the Turnpike. We will continue north on I-95, which brings us to Cocoa Beach. This is beach where I first experienced Florida’s atlantic coast as a child, the water, the sand, the seashells. Of course, the reason we stayed here was that it is part of Florida’s “Space Coast” and quite close to Cape Canaveral. The epicenter of the American space program loomed large in the imagination – even though the moon landings were long over, space was still a powerful draw and the vehicles, structures and devices that made space travel possible were quite exciting to see up close and could even mask the fact that so much of this technology was on the edge and quite inaccessible to most of us. In that sense, space has never really entered into our lives the way computer technology (which also started as remote and rarified) has done so. That is a bit sad. Despite all the joking about a certain presidential candidate’s recent “moon base” proposal, I have to admit I wish we were more ambitious again about expanding into space. We never really solved the problem of efficiently getting into orbit, and thus haven’t been able to make it truly route and accessible. There are those working on this problem, on the Space Coast and elsewhere, but that is a topic for another time. As one continues up the coast towards Daytona Beach, I-95 meets I-4, which heads westward and southward through the center of the state. It crosses Florida’s turnpike just south of Orlando and just next to the Walt Disneyworld Resort. Everyone knows Disneyworld. I had last been there as a teenager. 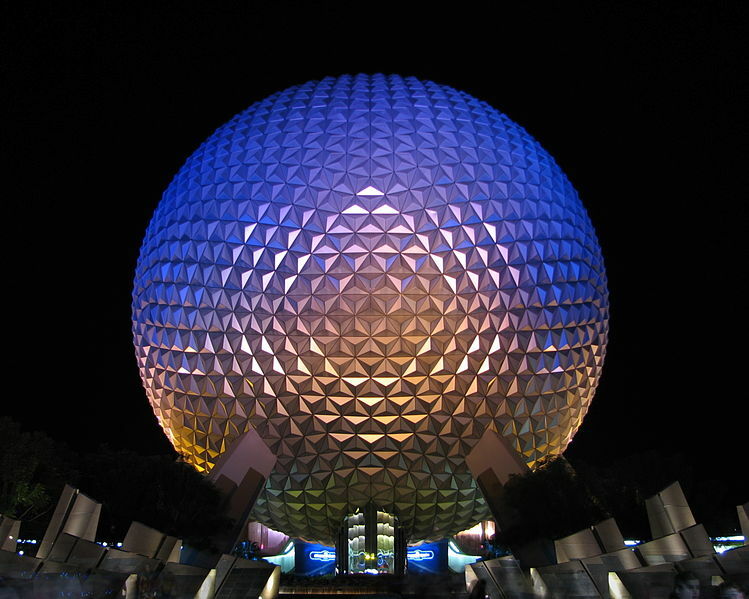 EPCOT center was visually interesting (in terms of the buildings and structures), although it was already quite “retro” when it was completed in the 1980s. And the rides were not particularly compelling. I can only imagine it seems very dated now, but that could add to its visual charm. It would be interesting to photograph. But perhaps as interesting from a photography perspective is another, now defunct, theme park just down the road. 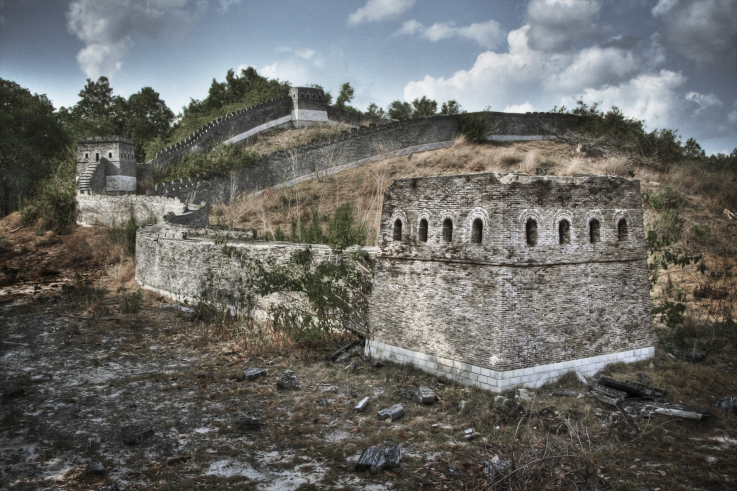 Splendid China, built and sponsored by the Chinese government, was a theme park that featured scale models of famous Chinese landmarks, including among others a miniature Great Wall. The park was never popular and closed in 2003. Since then, it has fallen into disrepair and is a frequent target of vandalism. I only found out about it as a result of a 2009 exhibition in San Francisco that included photographs by Thomas Cheng documenting the decay. I-4 continues southwest towards Tampa Bay, crossing I-75. I-75 is another major north-south national highway, and south of Tampa it largely follows along Florida’s “left coast.” It does, however, abruptly turn and become and east-west highway at the northern edge of the Everglades. This is the famous Alligator Alley. Along this section of I-75 is the Florida Panther Wildlife Refuge, home to the critically endangered Florida panther. There are perhaps around 200 left. The highway cuts through the panther’s habitat, but the rebuilt version includes passageways underneath for panthers to travel safely. It also facilities the movement of other wildlife. Of course, one does find alligators along the highway. 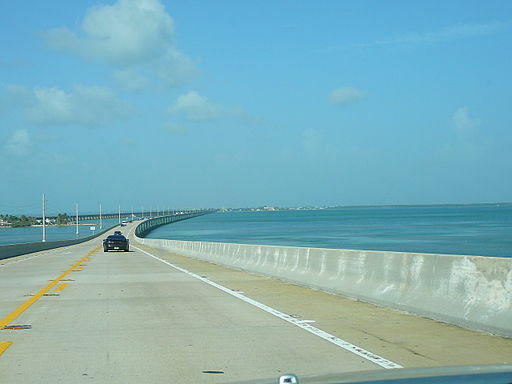 Returning to the beginning point of our virtual tour, one can travel south on US 1 to the southern tip of mainland Florida, where it becomes the Overseas Highway through the Florida Keys. 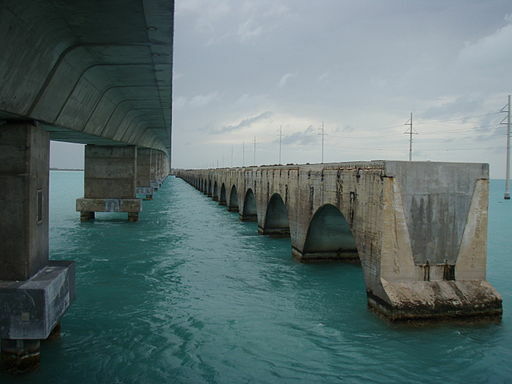 The highway links together a series of bridges and causeways through the keys. Some of the structures of this beast were part of an older railroad, and have since been replaced. But old sections remain. US 1 eventually comes into Key West. It makes a final right turn onto Whitehead Street, passing by the Ernest Hemingway Home and Museum. 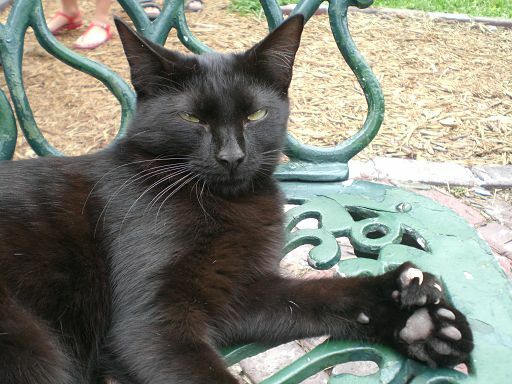 Among the current residents of the home and museum are “Hemingway’s Cats”, who are descended from the author’s cats and many of whom are polydactyl with extra toes in their paws. Hemingway was quite fond of these cats, and the museum has become a permanent home for them – we of course hope it stays that way. Only a few blocks away, US 1 ends. This “end” assembly with Mile 0 marker is probably one of the more photographed ones in existence. It probably gets stolen quite a bit, too.